PARENT ALERT: YOU TOTALLY NEED THIS PRINTABLE CHRISTMAS WISH LIST FOR KIDS!! As a mom, I often struggle with giving my kids too much or not enough. I often wonder where the balance should be. Should I spend $50 or $100 on a birthday or a Christmas gift? Am I causing my child to become materialistic or simply showing my love? 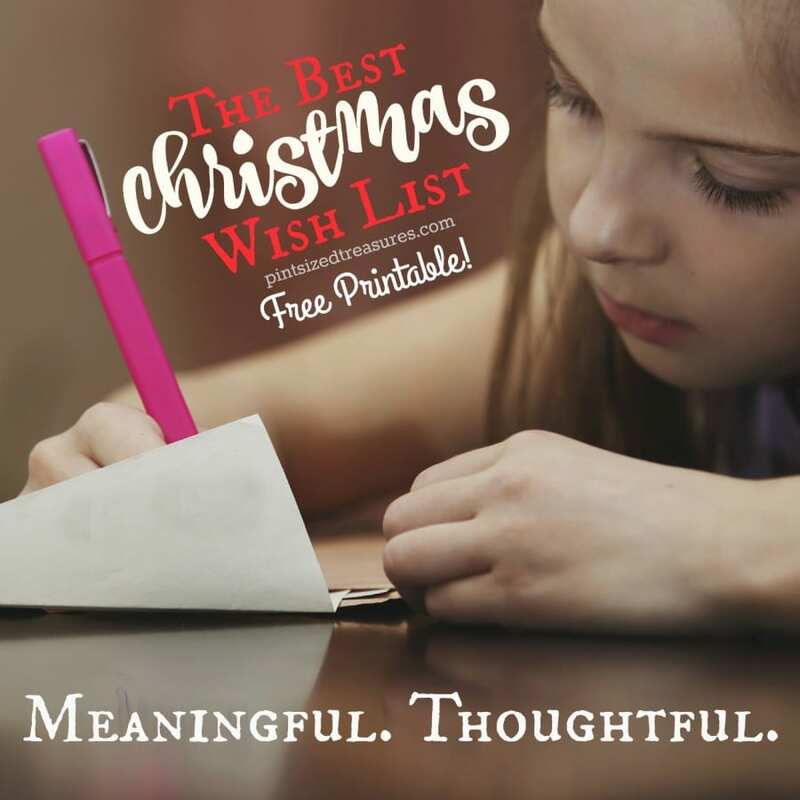 That’s where this Christmas wish list comes in — it helps parents and kids keep the right attitude and perspective during the biggest gift-giving and receiving time on earth — Christmas! If you’re like me, sometimes you look at a child’s room and think, “What in the world?! There is no possible way that child could play with all those toys at once!” In fact, I think giving a child too many toys snd play items creates stress, materialistic mindset and a parent’s worst nightmare — innumerable messes around the house. Have you heard of a popular, simple plan that some families follow for the holidays? I wanted to share it with all of you and also include a super-cute, printable list that you can your kids can post on the fridge. I’ve also added my own twist to the list that I think should have been added years ago! 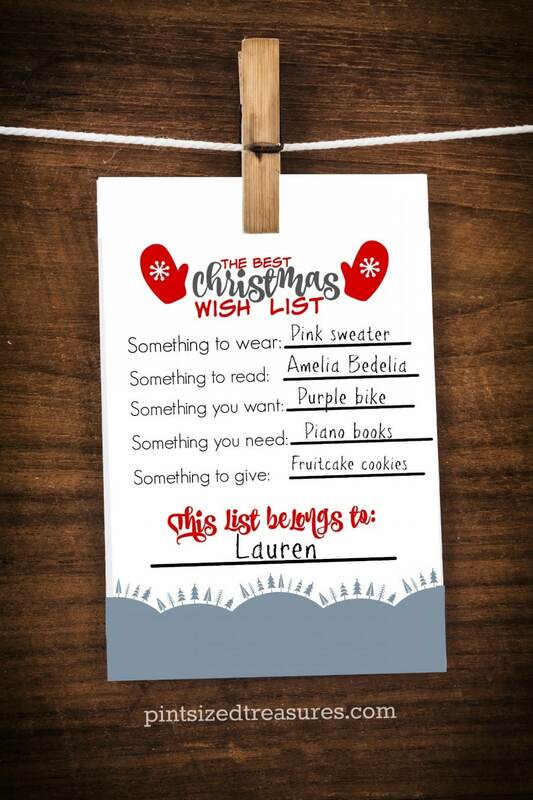 When asking your children to create a wish list this year, make it easy and hand them the list below. It will not only encourage them limit items, but also help them focus on the needs of others. And, hopefully, writing these ideas out will help everyone see what is a actual NEED and what is in reality a want! 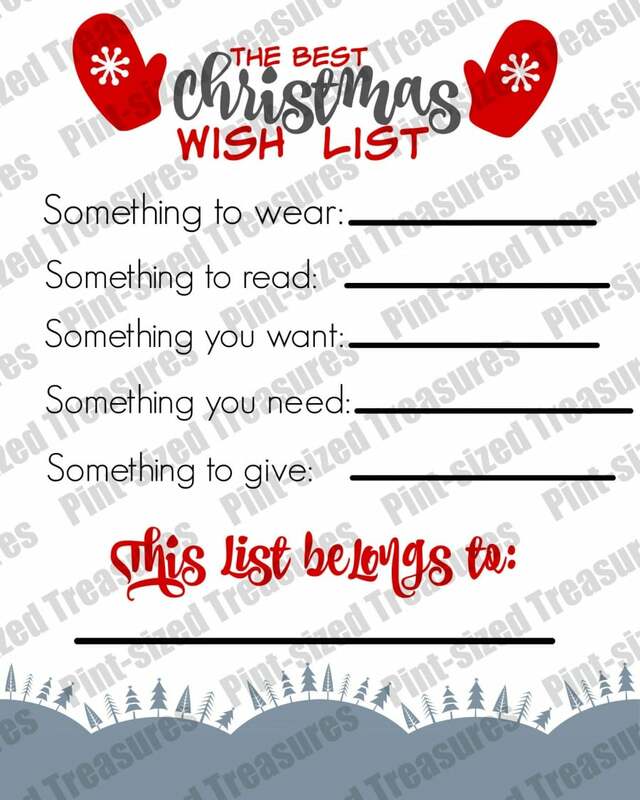 It might not be a bad idea for parents to write out their list too! Something to wear. Kids are always growing and need new clothes, shoes, belts and socks. Use the gift-giving time of year to purchase one of these very-well used items. Since it’s a Christmas gift, it could be an extra special item that normally you won’t purchase. Something to read. A reading kid is a growing kid! An important part of parenting is helping your cild learn and stay educated about a various amount of subjects. help your child grow her knowledge by purchasing her an amazing book to read! Something you need. Ask your child to name something she needs. With kids, there is always something! Something you want. Not a list of 6 items, but one. This is a time that we all splurge a little and get our kiddo something they’ve been spying. Maybe it’s a calico critters set, a new dress-up costume, or even a Lego City set — just as long as it’s not a Barbie doll — wink, wink! Keeping this list to one item will help your child still have fun opening her gifts, but keep the gifts, trash and money under control. Plus, most of the time other friends or relatives are purchasing “wants” too! Something to give. This is what I add to the traditional perfect wish list for kids. Christmas is a time that’s set aside to focus on giving. But, if you ask me, I whole-heartedly believe that we should consider giving to others on a daily basis. There are always needs around us! Help your child brainstorm about who to give to and what to give. My kids love going to the store and choosing an item for a friend, relative or neighbor. If money is an issue, you can bake cookies, banana bread or other goodies to give! Even time or help with chores is a gift too! My kids often make coupons and card for each other, which is always super-sweet and well-received. Don’t let lack of money keep you or your child from giving! To get your family started on the perfect wish list, grab it here! Enjoy!